The price of food continues to drop and I recently went to the grocery store and picked up two boxes of 18 eggs for $2 and I’ve never seen such a deal on eggs before, at least not in recent memory. I have also noticed the price of other staples down significantly such as rice and beans. Bacon/Ham, Lobster, shrimp and certain fish categories also to continue to drop in price but one thing that perplexes me are beef prices. I keep seeing certain cuts of meat as high as $8/lb and others constantly on sale at $0.99/lb so I can’t figure that out. According to this post over as Global Economic Analysis, wholesale prices have dropped the most in 50 years and I am certainly seeing that in grocery items. The generic price of bread continues to drop although I’ve see no change in price from the name brand price I usually buy but I’ve stopped buying the name brand and use the store brand now. I can’t justify a 100% price difference from generic to name brand when there’s only a marginal taste difference. I can swallow the difference! Have You Noticed The Price Deflation Everywhere? Comments Off on Have You Noticed The Price Deflation Everywhere? 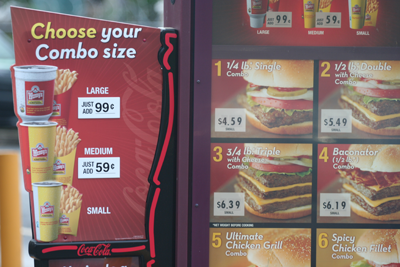 If you haven’t noticed, almost every fast food restaurant has a new “value priced” menu which is significantly lower than previous menus. Quiznos now has the $4 Torpedo sandwich; KFC has a new dollar menu; Popeye’s has a $1.99 special; Subway now has $1 sides with the purchase of a sub; Domino’s now has $5 sandwiches and pizza. The two items at the grocery store I’ve seen significantly drop in price are breakfast cereal and beef. I now regularly buy breakfast cereal for about $1.20 per box where a couple of years ago, cereal was costing me $4+ for a similar box. So here’s what my recent purchases of my “basket of goods” shows for April 2009. It is becoming difficult to compare “apples to apples” because the prices of food are all over the board. For example, the boneless ribeye steaks are $8.79/lb but the bone-in ribeye is $3.50/lb which is a huge difference. In this particular instance, I purchased the bone-in ribeye which makes perfect sense. 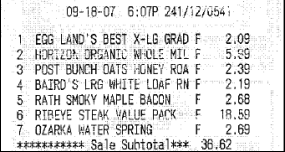 The grocery store also offers in-house coupons for many items, the Honey Bunches of Oats cereal was priced at $2.32 for 14.5 oz box but came with a $0.50 off coupon meaning the true cost was $1.82. I did find loaves of bread from as low as $0.88/loaf but I try to keep as consistent as I can with the pricing on the basket of goods so I purchased the same loaf I normally do for $2.44. Overall, if I practiced “substitution” like the government suggests and purchased the lowest priced items across the board, then I would save that prices have deflated about 20% across the board. Other items that I don’t track have dropped dramatically in price such as lobster, shrimp, fish, beef (non-ribeye), chicken, and many other staples so there is no question in my mind that we are in a deflationary period, I suspect that by next quarter if things haven’t improved, the prices for the same brand items that I buy will drop. I actually didn’t believe the numbers when I was putting them together. I hope I didn’t do the math wrong on the calculations. I tend to screw up simple math but can handle complex equations rather easily; I haven’t been able to figure out that one. The price of cereal dropped a whopping 24% and this was the biggest shocker for me. My kids LOVE cereal and I clearly recall cereal costing $4 or $5 a box last year but when I went shopping most cereals were selling for $2 or less. The size remained stable at 14.5 oz too, no shrinkage! It didn’t appear to be a “sale” price either as I didn’t see any sale tags; I think that’s they everyday price right now. The second shocker was bacon. A 12 oz package of bacon dropped down to $1.49 or 26% from the last time I checked the price. I try to be consistent and buy the same brands but the brand I was previously buying was no longer sold at the store so I switched to another brand. There were several brands selling for $2/5 but the everyday price was $1.49. There were slight decreases in the cost of bottled water and a loaf of bread (same size as last time). The only increase was the cost of beef rib eye steaks. The cost actually went up a penny so I wonder if the beef industry or the grocer is hosing the consumer. If cereal grains are down then why isn’t beef? I’ll try to do this quarterly from now on as was my original plan but there is no doubt that deflation has hit the grocery store. A little over a year ago, I wrote this post questioning The Simple Dollar’s math regarding the benefit of a home made burger vs. McDonald’s $0.99 double cheeseburger. The math was close and depending on what variables you included it was pretty much a wash.
It’s now a year later and inflation has made the cost of beef, cheese, condiments, and other ingredients go up dramatically these past twelve months. I was amazed to pay $18.00 for three NY strip steaks (uncooked) at Costco this past weekend when I went shopping. The cost of beef has gone sky high recently and doesn’t appear to let up. I hope Trent will redo his home made burgers and enlighten us all on the new adjusted cost but I suspect that won’t happen. If it does happen, it may wait till beef goes on some super sale where the numbers can be distorted to make the scenario fit the argument. As for me, I can go buy 3500 cheeseburgers if I wanted because some of my investments have paid off handsomely recently and that’s what I’m all about. I was combing through some old posts gathering research for an entirely different topic when I came across an old post that connected so many dots, I figured I had to write this post to try to paint a picture for everyone. Back in September 2007, Trent over at the Simple Dollar wrote this post about grilling your own burgers at home vs. buying a $0.99 double cheeseburger at McDonalds. It was right around the time I started tracking inflation in my “basket of goods” category too so hopefully this will make sense (connect the dots). These numbers were taken from the post back in September 2007 so flash forward to April 2008. Using my numbers for steak (sorry I’m not tracking ground beef), I have written this post outlining how beef prices have increased 7.7 percent from September to today and bread has gone up 13 percent. So the new cost with just the two items changed is now $14.40. I’m not sure how much cheese or ketchup have gone up and I’m making a ratio assumptions on the buns and beef similar to the regular bread loaf and steak. So if these ingredients are now $14.40 then the homemade cheeseburger is now $0.90. Getting real close to that $0.99 price and you didn’t have any cooking labor involved huh? If cheese and ketchup went up then it’s now a wash but even if it isn’t a wash, all you have to do is wait until September 2008 rolls around and do the math again and you’ll find that cooking your own burger is more expensive than buying a $0.99 Double Cheeseburge (assuming McDonalds doesn’t raise prices). But what is the point of revisiting this anyway you ask? The Digerati Life pointed out the whole frugalism vs. capitalism debate and I pointed out that as long as we live in an inflation based economy, it is impractical to focus on frugalism as a way to get ahead economically because it erodes your quality of life. Instead of spending 10 minutes at McDonalds eating, you waste hours grocery shopping, cooking, and cleaning on the premise you’re “saving” money when that time should be focused on earning income or researching investments that will yield returns greater than the time invested. It boils down to a basic ROI/TVM calculation. The actual post I was researching was on home gardening. I’ll probably post that next week but it is similar along the lines of this post comparing an industrial farmer to a home gardener – there’s no contest! Most people have an intuition about whether something is of good value or not and the success of McDonalds (billions served) is an indication that this company knows how to provide good value to their consumers and explains why their stock price has increased 14 percent from $50 in September to $57 today but they’ll eventually struggle with inflation too but they have a much wider set of options to mitigate prices increases (leverage purchasing power, reduce labor, put pressure on vendors, etc). I hope Trent posts a follow up on September 12, 2008 to factor inflation into the equation. Inflation at ZERO Percent and I have Proof! I went grocery shopping and bought my “basket of goods” to track inflation. I had intended to do this quarterly but I’ve been swamped with too many personal and business projects to keep up. In any event, here’s my basket of goods and the rate of inflation. 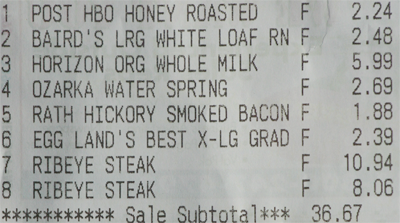 *A side note, the Bacon package was on sale and rather than distort the numbers, I used the sale price. The non-sale price was $2.19. Now let’s compare this to the basket of goods I bought back on September 2007. So overall, the cost of things are the same right? Inflation is at ZERO percent just like the government says! Wait a minute….upon closer inspection, I noticed that the box of cereal was a tad bit smaller than the one I bought in September and as I look closely, I noticed that the box is now 14.5 oz and not 16 oz so the adjusted price of the box of cereal is actually $2.47. I’m also getting a little less beef and the grocer conveniently packaged the cuts to seem like the same price in the past but the steaks were noticeably smaller. Unfortunately, I didn’t capture the exact size of the loaf of bread back in September so I can’t compare those numbers for portion shrink. So let’s compare apples to apples. So beef is up 7.7 pct, bread is up 13 pct, and eggs are up 14 pct but the government expects you to substitute beef for bacon because it’s on sale but what about bread, cereal and eggs? I guess cattle ranchers, wheat farmers and poultry farmers will all go out of business or switch to raising pigs because after all, we all substitute expensive stuff for cheaper stuff right? Notice that I’m not even tracking gasoline because that’d give you a heart attack. It’s no wonder why there are riots in Egypt and the Philippines are panicking over wheat, China is panicking over rice and Mexico is angry over the price of tortillas. A $0.10 increase for cereal or bread might not be big deal to you but multiply that x 2 billion people and you begin to see the problem. But there’s more to the slight of hand tricks because as you can see from the image below, fast food chains are now charging to “upgrade” to medium combos. I don’t eat fast food too often but the other day I drove by Wendy’s and ordered a combo. I was startled by the sign aside which stated that it would cost $0.59 to “upgrade” to medium size. Medium size used to be the standard size! Who are the big winners with the Feds move yesterday? Borrowers. Who are the big losers? Savers. A few readers questioned my motive a month ago why I went to all my credit card companies and requested credit line increases in this post. I by no means foresaw the Fed cutting rates by 1/2 point but I did suspect the easy money would be flowing again which is why I wanted to get more juice that I could tap. If you’re an avid reader of Get Rich Slick, you know I like to play it both ways. I’ll borrow heavily at 0% and invest that money into higher yield savings. Heck, I’ll borrow at 0% so I won’t have to pay even a low rate on a secured loan on a car! So this Fed rate cut will be a boon for my extra curricular investment activities. Unfortunately, the Fed rate cuts and money dumping will mean inflation will spike higher which is why I’ve added a new category called “Basket of Goods” which I will use to periodically post the cost of a basket of goods at the grocery store to track real inflation. I’ll follow on December 18th with another basket of goods to see how much the cost have gone up.